Part I � Thinking about Acceptance explains six mental models that are useful when thinking about the acceptance process. 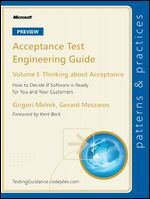 Part II � Perspectives on Acceptance describes the acceptance process from the perspectives of key stakeholders in two different kinds of organizations: the Information Technology Department in a business and the Product Development Company. Most readers involved in the acceptance process should find some commonality with at least one of the roles describes. Part III � Accepting Software introduces the practices that are necessary for planning the acceptance process, for performing acceptance testing and for improving the acceptance process.